Onward to Madrid! | .liveit.loveit.blogit. On Saturday night, Clara slept like an angel. She hasn’t slept for seven hours in a row for months and months, so it was such a treat for us all! We had about an hour and a half to kill in the Barcelona train station, so we stopped for food. In Barcelona you can get tapas in the train station. While it was still train station food, it’s certainly a step up from your average prepackaged sandwich! The fast train to Madrid was a breeze. The seats were comfortable there were power outlets, and Clara loved looking out the window. She especially loved when we would go into or come out of the tunnel and the view in the window would change dramatically. Our arrival in Madrid was a bit more hectic, we had trouble finding the taxi stand, and then we had trouble getting in touch with our host. Turns out the latter was an AlBug, she was in the apartment the entire time. But getting to the apartment made up for everything. This one is beautiful, and seems to be a bit more baby safe than the last one. Something about laminate (vs. tile) flooring we think. This apartment has a tiny functional kitchen, adorable bright bathroom, living room complete with a chaise, and a large bedroom. The kitchen and living room overlook a bright, south facing courtyard, there’s a fairly bright lightwell in the middle of the apartment, and the bedroom has a large desk and french balcony over looking the street so various rooms are bathed in light throughout the day. 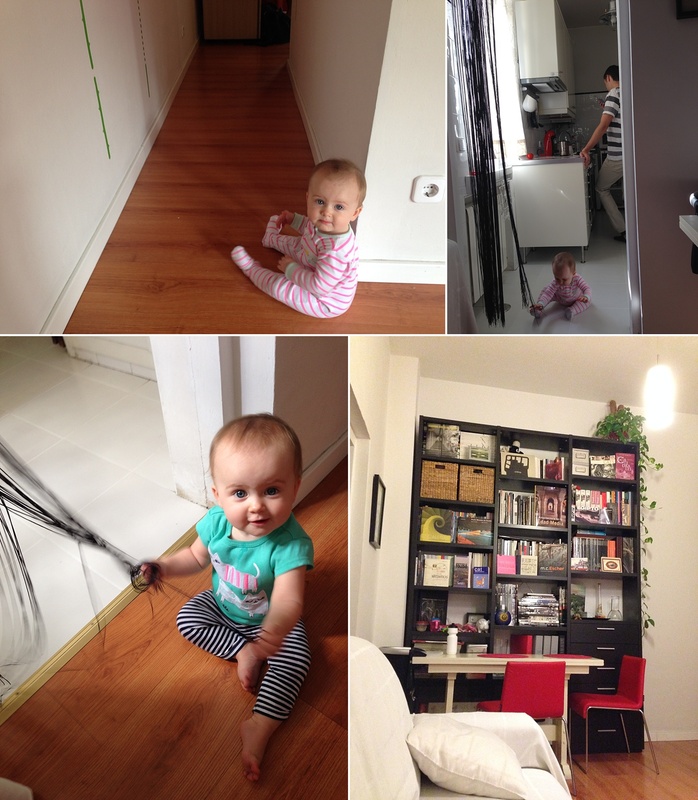 Clara’s favourite part of the apartment are the strings that separate the living room from the kitchen. It’s like hair but better! (Don’t worry, we’re keeping it baby-safe!) We spent the early evening exploring the neighbourhood and going out for a local dinner. 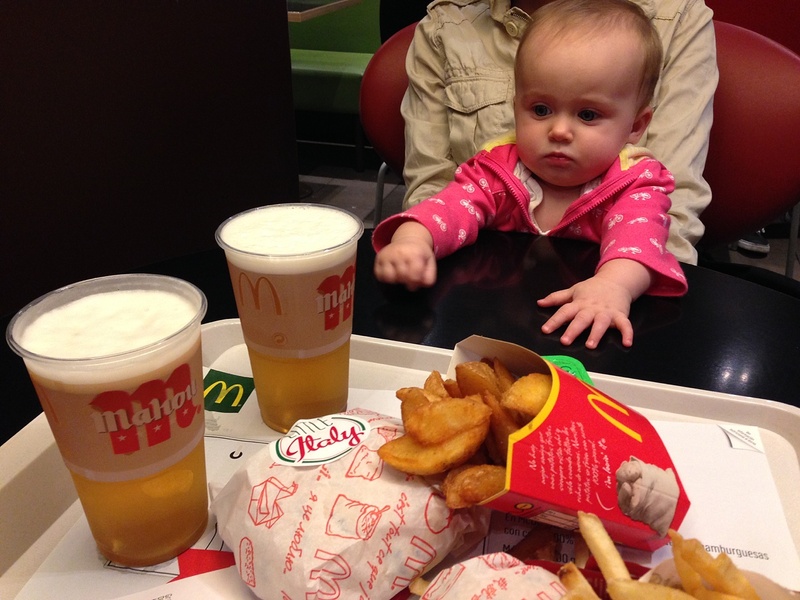 Well, sort of local, who’s ever heard of a Soho burger, potato wedges (deluxe fries) or beer at McDonald’s?! Clara didn’t sleep quite as well on Sunday night, but we don’t think it was jetlag. We think she was maybe a bit scared. This is her sixth different sleeping place in 11 nights! She’s quite the little traveller! On Monday, we started to try to get back in a little bit of a routine, I woke up and worked, then we went for a family lunch on a terrace, and then J worked from a café in the afternoon. Meanwhile, Clara and I played. I also found the local hypermarket and cooked us a delicious dinner of Calabrese salad, eggplant bruschetta, and grilled chorizo. Our sick baby is finally getting better—as evidenced by the enormous amount of food that she ate at dinner! Then it was into the bath and off to bed for her. I have missed all these! But have loved catching up. 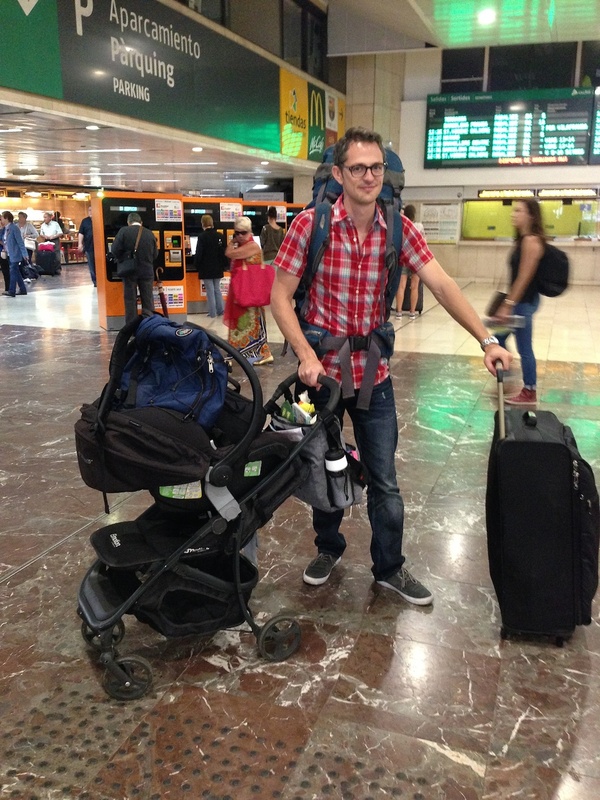 Look like you are all figuring this traveling thing out ;) i love all the luggage in the picture with Jon. I have take a few like that…. But you guys have the packing lightly down pat, I think. Miss C. Seems are inquisitive as ever!!!??? Ps i love your hair!! !